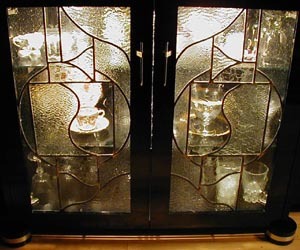 WE WANT TO DO YOUR CUSTOM GLASS WORK! We enjoy taking your needs and ideas and creating a piece of glass art that you will be proud to hand down through the generations. We try to take the colors & designs you like, and create a piece that will allow these to interplay with the ambient light. We have particular interest and expertise with nature and its creatures, as well as religious themes and church windows. We do all our own framing, including a variety of wood frames, created to augment the colors and theme of the particular piece. We have used walnut, cherry, oak, myrtle, re-claimed chestnut, barn wood, osage orange, sycamore, birch, maple & mineral stained willow. And, on occasion, we will include wood incorporated within the panel itself. If the panel will not be inset, we use side brass panel hangers for those pieces to be suspended by chain. We create over 90% of our own patterns, usually from a photo someone has provided and whether it is a 3 foot tall heron, an eagle with a 4 foot wingspan, or the ruby red eyes of wood ducks or loons, we strive for realism in color, texture and eye. Our patterns are only used ONCE, for your piece and then cataloged and stored, not to be used again by or for anyone else. Antigo, WI (8 windows, a lighted cross with ruby rippled Uroboros glass framed by Kentucky black cherry wood & a 12 inch white Youghigheny glass dove mounted as if ascending from the cross to the windows ). Phlox, WI (2 windows in the dining room of native wildflowers & birds in a natural setting). if we don�t have what you need, we can get it within 24 to 48 hours. We are here and want to help you with your glass projects! Copyright � 2019 The Old Hen House Glass & Craft Shop, All rights reserved.